Finish off your Original Kadia with a tripod and cooking bowl set. Available in a variety of sizes, the tripod will fit on top of your Kadia, and you can get simmering with the morning porridge or afternoon stew. These handcrafted bowls have a protective oiled coating for transport and will require the traditional ‘curing’ process for this style of pan prior to use. 1. Heat the bowl to a medium heat to burn off the coating, then wash in warm soapy water. 2. Dry the bowl thoroughly and re-heat to drive off any moisture. 3. Apply a thin coat of vegetable oil whilst still hot with kitchen roll and wipe off any excess oil. 4. Re- heat to a medium temperature and leave to cool. 5. Now your Cooking Bowl is ready to use. You can repeat the oiling process whenever necessary to keep your Cooking Bowl in tip top condition and the more it is used, the better the natural non-stick finish becomes. Avoid cleaning in a dishwasher as this will remove this natural oiled finish. 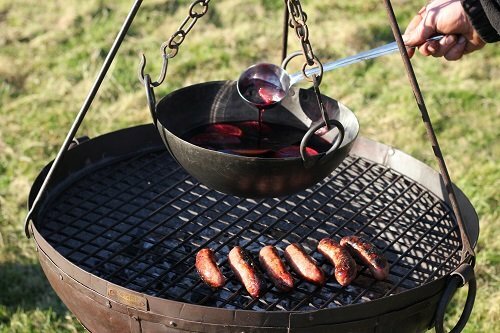 With the Cooking Tripod Chain still connected to the three cooking bowl chains remove from the heat and place directly on your table using the enclosed Trivet and serve. You can place the bowl directly into the fire for a real authentic cooking experience.